Interesting wording for historic headlines always get my attention. 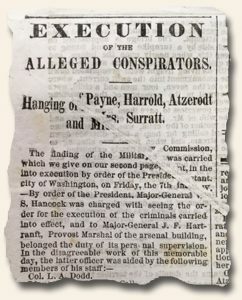 We recently discovered an 1865 issue of the “New York Day-Book ” which has at the top of the front page: “Execution Of The Alleged Conspirators…”. Makes one think: shouldn’t they be determined to no longer be “alleged” before they are executed?